← Red Velvet Shipping, Brisbane Show and Sewing Along! Last time I painted a pair of shoes it was to wear on stage. Turquoise and purple to match a costume. I haven’t given it a go since. 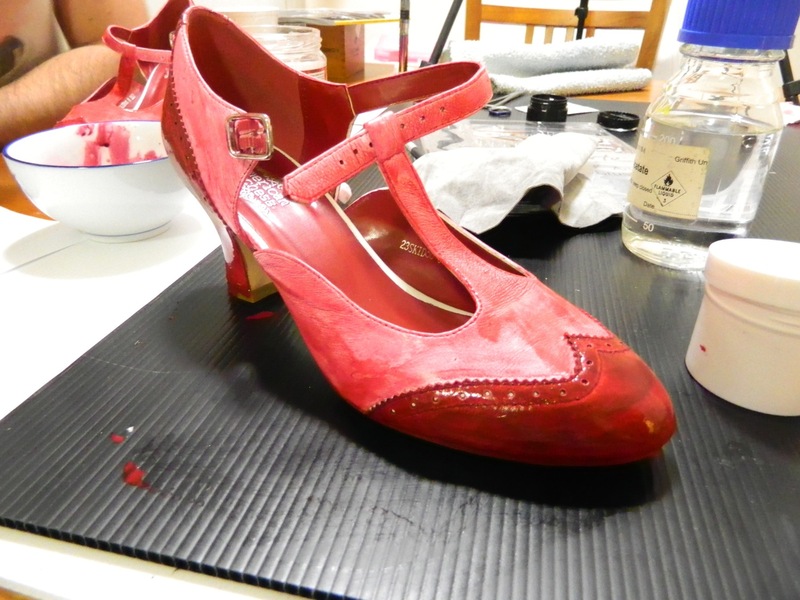 I have wanted to dye satin shoes before but I’ve never been brave enough! PS. Your shoes look fantastic! These are certainly cool – I like how you made them two-tone solid, I think I like this effect much more than the more contrasting styles that are the default. Just amazing. I’d have never have thought to do this. Inspired! How lovely! I love my 23Skidoos as white shoes, but I figure that whenever they eventually get too scuffed up (which will likely happen one day, as I dance in mine quite a bit) I’ll paint them. I have no idea what I color I’d paint them, though. Likely something in the red or mint green color family. Maybe black + a metallic. They are awesome! Red is one of my favourite colours and I would love a pair of shoes like that.They look like they have a good heel, not too high. Shoes that fit me are near impossible to find, (wider than average toe, high arch and narrower than average heel = shoe fitting disaster!) 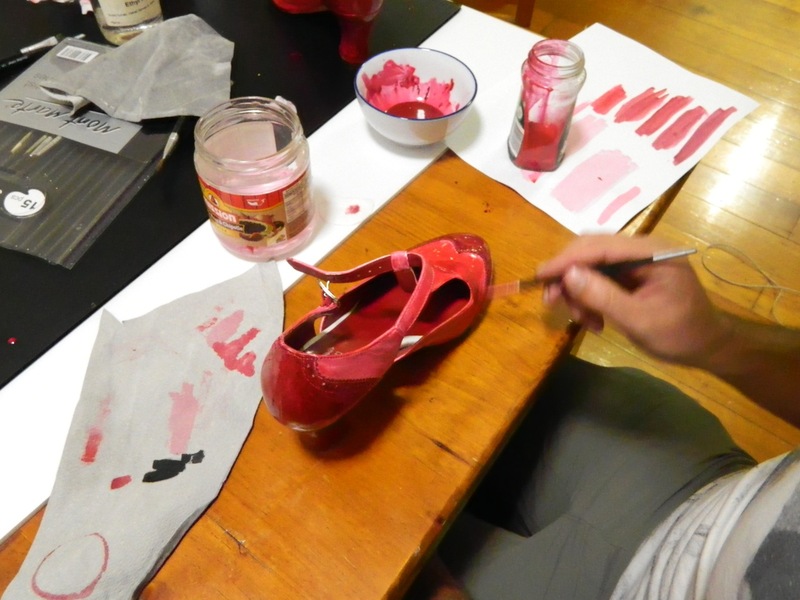 so I don’t think I would ever be brave enough to paint any shoes that fitted me incase I ruined them. So glad yours turned out so lovely. I have never painted shoes, but yesterday I fixed two pairs of boots with some glue. One of them I was initially planning to strip the fake suede off and cover with fabric but glueing it down was actually a quicker fix. I might still cover them one day though. It’s nice to have you back. Any chance you’re going to continue with your Three Graces project? It was so interesting! 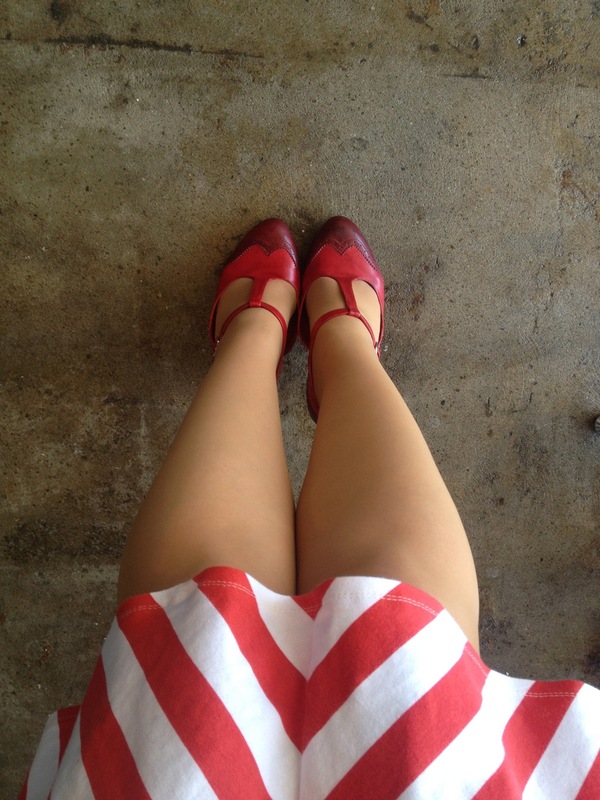 The shoes look fabulous, and so does your Penelope dress! Love the occasional posts! :) Hope you have a great weekend! Cocoa and carmine? So, so excited about those!! Carmine, carmine. Making her perfect… :) I played the pattern through polarfleece, sweatshirting and a very fine rayon jersey to make sure fit was consistent and the sewing flowed, then they’ll be my sewn samples.. 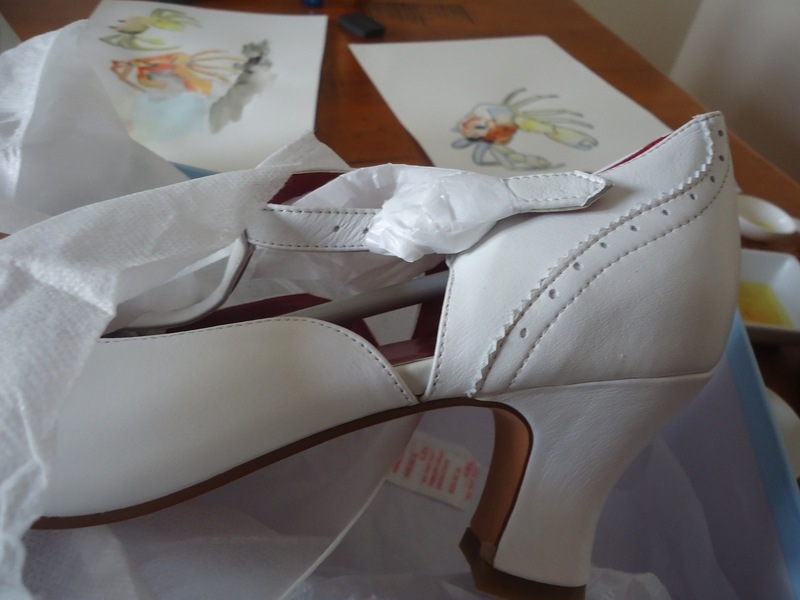 I painted some shoes the other day to go with my Hummingbird but I only wore them once and the heel fell off! So new shoes for me – what a blob?? Red Velvet pattern arrived last week so made a special trip to Albany for fabric on Fri. Looking forward to starting the sew along. Oh!! That’s disappointing, I’m sorry for you Lyn! also, i LOVE LOVE LVE your stockings!!!! Your shoes look amazing. I love the heel, I have three pairs of boots with this heel and can wea them all day every day they are so comfy. Seeing your shoes I would so give shoe painting a go now. And they’re comfy… That’s the kicker! They’re wearable! AND cute! AND indie! AND I can paint them any color I want!! :) It’s very exciting to me..
Ooo, thanks for the details! 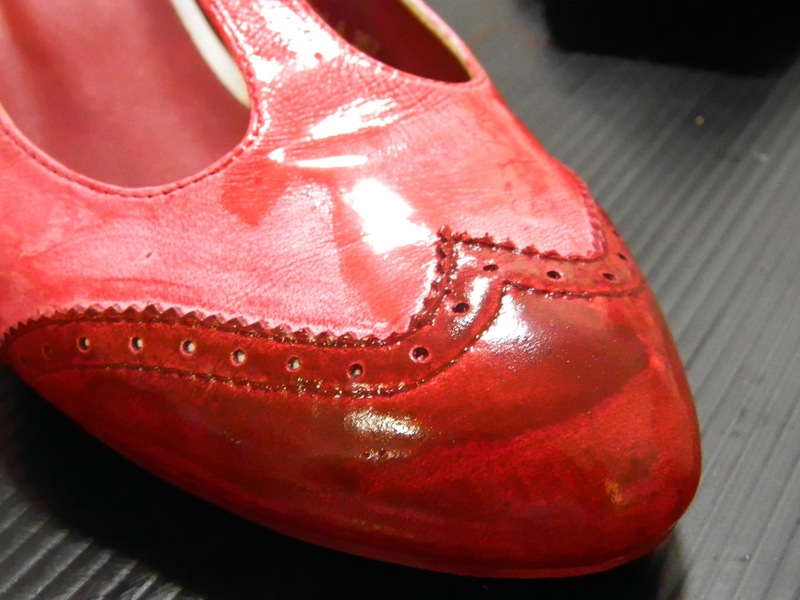 I love the slow fashion here, that you waited so long for the shoes to be made just for you, and then you spent the time painting them exactly how you wanted. Such a novel idea Now A Days, especially since it was how things were done Way Back When. They turned out gorgeous! Yes… Most of the people I consulted about how to get this done thought I was crazy/weird so it’s nice to have them done and pretty and wearable! :) The cobblers I asked (even my steampunk cobbler with the top hat) thought it sounded extremely odd that I’d want to paint/dye my own shes… ;) But if I can buy good quality, solid “blanks” and paint them myself that really opens up all kinds of shoe possibilities… I *like* that… A lot..
Lovely shoes! Wish I could wear heels. You have opened my eyes to a whole new way of accessorising woot! 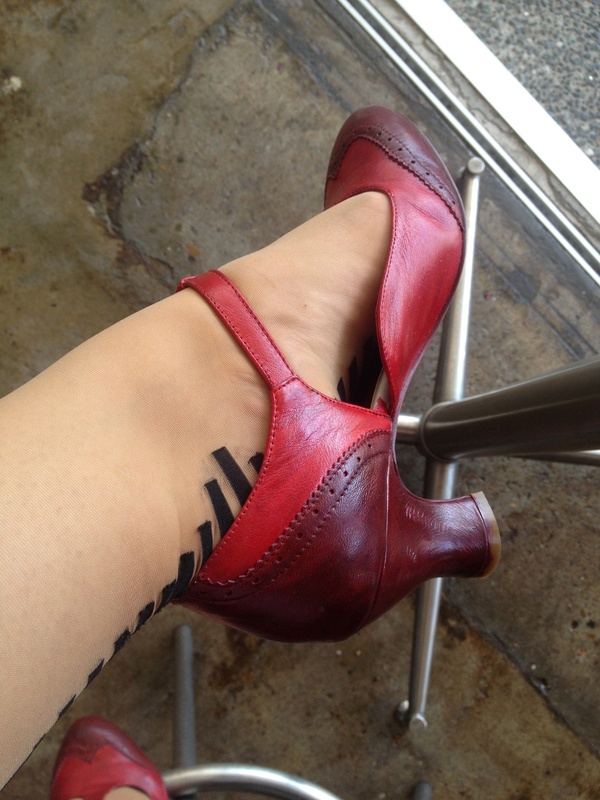 Last year, I enquired bout dying my red suede heels, I was quoted approx $70. Pricey, considering I bought the shoes for $100. I did a really rough job cos I was going to through the shoes out anyway. I *love* the stockings. Beautiful outfitting. Omg! Fantastic! I think the shoes are ok white, but they are fantastic red! Love this! Steph, ages ago you said to let you know when I had organised a Brisbane Blogger’s Meet up… well finally I have. Open invitation to any Brisbane sewists who want to come. I don’t have a large readership so I hope you don’t mind me free advertising on your blog. It’s not fancy like the southern states one – I just don’t have the time and too close to Christmas. These are awesome! I have another question though – did you line your Tira? If not, how did it not stick to your stockings? Thanks! No, I don’t line knit dresses… I don’t find it sticks, either, it’s just not something that comes up… When I wear stockings, I tend to wear the ones that are really slippery, I don’t like “grabby” stockings fabric. (and sometimes, when I’m wearing seamed stockings I’ll lightly mist the back seam with hairspray so it won’t twist..) Hope that helps!